Recently, Phil Tagami announced plans to host the 2018 East Bay Innovators Awards on behalf of his childrens’ school, East Bay Innovation Academy. 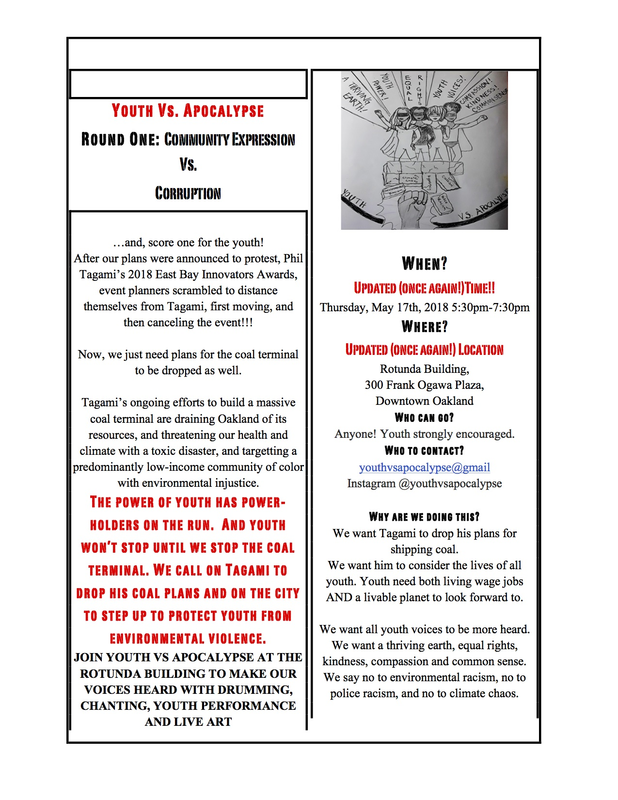 But Tagami is completely draining Oakland of its resources, and threatening our health and climate with a toxic coal terminal, targetting a predominantly low-income community of color with environmental injustice, and was planning to honor DA Nancy O’Malley, who has a record of protecting police, not youth of color. After plans were announced for a youth-led protest, event planners scrambled to distance themselves from Tagami, first moving and then canceling the event!!! Now we just need plans for the coal terminal to be dropped as well. Join Youth Vs Apocalypse at the Rotunda Building to make our voices heard with drumming, chanting, youth performance and live art. Who can go: Anyone! Youth strongly encouraged! !